More and more, consumer preferences are trending toward businesses and products with a social purpose. 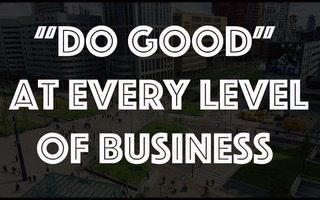 But businesses that aim to “do good” are nothing new. There is evidence of farmers, sailors, and tradespeople in ancient Greece and India helping the poor or aiding their workers. And we can find the same from the Middle Ages through modern times. What is new, perhaps, are the countless ways that modern businesses work toward making the world a better place. At a structural level, the financial models available to those who want to build “doing good” into the DNA of their business are increasing rapidly. Buy-one-give-one models and benefit corporations, to name a couple, are more common than ever before, allowing businesses to maximize social impact along with profits. Though questions about the transparency and accountability requirements of social enterprise have been raised, these models are growing in popularity as a young consumer base searches for socially conscious options. Opportunities are virtually endless in the realm of traditional corporate social responsibility, too. From mega-businesses like Merck that give away millions of dollars’ worth of drugs to cure river blindness, to small companies like Play It Again Sports that sponsor sports teams or donate to veterans’ causes—large, medium, and small firms alike have found that giving back to their communities is not only enjoyable but also profitable. Customers are attracted to businesses with such philanthropic spirit—and so are employees, it turns out. And executives know the power of “doing good” by their employees. Business leaders are discovering the value that new educational opportunities like ethics training bring to their organizations. This is true across industries: ethics has become a standard offering in university programs; large corporations like Google and Apple routinely cite ethics in their business decisions; the United States military boasts a center for ethical leadership. Our Fall Executive Breakfast for the C-Suite will address the ethics of traditional corporate structure and social enterprise alternatives. Our Annual Trustee Meeting, open to the public, will highlight how the ethical leader does good. The popular Fall Mind Candy Dialogue will feature a lively discussion about the various business strategies for making positive changes in our community.